Launchpad, the application launcher that Apple introduced with OS X Lion (10.7), was an attempt to bring a touch of iOS to Mac’s operating system. 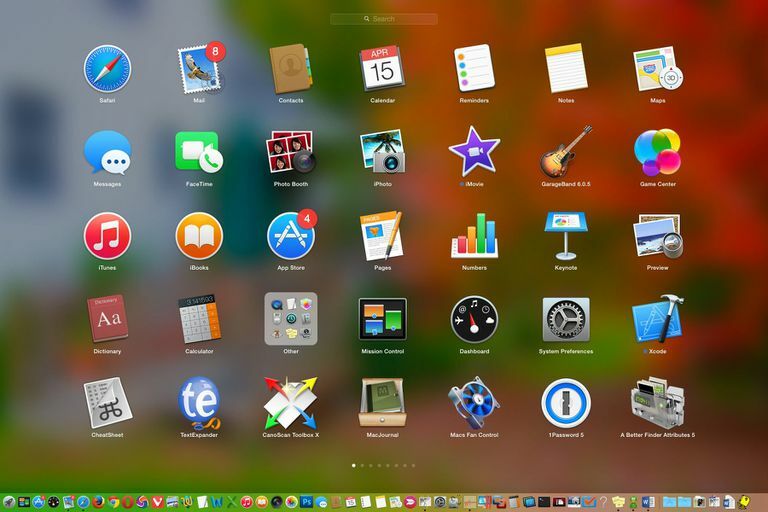 Like its iOS counterpart, Launchpad displays all of the applications you have installed on your Mac in a simple interface of app icons spread across your Mac's display. A click on an app's icon launches the application, letting you get right to work (or play). Launchpad is pretty simple. It displays app icons until it fills up your display, and then creates another page of icons that you can access with a swipe, just like in iOS. If you don’t have a gesture-enabled input device, such as the Magic Mouse or Magic Trackpad, or a built-in trackpad, you can still move from page to page with a simple click of the page indicators at the bottom of the Launchpad. So far, it seems pretty simple, but have you noticed how fast Launchpad moves from page to page, or how fast it actually launches when you first select the app? Launch speed is very impressive, even more so when you realize that all those icons on a blurred, semi-transparent background take a good deal of graphics horsepower to pull off. How does Launchpad manage to run like a Kentucky Derby champ? Well, unlike the magnificent animals at Churchill Downs, Launchpad cheats. Instead of building thumbnails of each application's icons each time the app is launched or a page is turned, Launchpad maintains a database that includes the app icons, where the app is located in the file system, where the icon should be displayed in Launchpad, plus some other bits of info necessary for Launchpad to perform its magic. Luckily, Launchpad failures aren't as destructive as mishaps at Cape Canaveral. For Launchpad, about the worst that can happen is that an icon for an app you deleted will refuse to go away, icons won’t stay on the page you want them on, or icons won’t maintain the desired organization you created. Or, lastly, when you create a folder of apps in Launchpad, the icons return to their original location the next time you open Launchpad. In all Launchpad failure modes that we are aware of, no harm is ever done to the Mac or any installed application. While problems with Launchpad can be annoying, they're never a catastrophic issue that can cause harm to your data or Mac. The fix to Launchpad problems involves a deleting system and user data, so before proceeding, make sure you have a recent backup. As mentioned above, Launchpad uses a database to store all of the information needed for the app to perform, which means that forcing Launchpad to rebuild its internal database can repair most of the problems encountered. The method for getting the database rebuilt varies a bit depending on the version of OS X you're running, but in all cases, we're going to delete the database and then restart Launchpad. Launchpad will go to grab information from the database and quickly discover that the file containing the database is missing. Launchpad will then scan for apps on your Mac, grab their icons, and rebuild its database file. Quit Launchpad, if it's open. You can do this by clicking anywhere in the Launchpad app, as long as you don't click on an app icon. You need to access your Library folder, which is hidden by the operating system. Once you have the Library folder open and visible in the Finder, you can continue to the next step. In the Library folder, locate and open the Application Support folder. In the Application Support folder, locate and open the Dock folder. You'll find a number of files in the Dock folder, including one named desktoppicture.db, and one or more files starting with a dashed set of capital letters and numbers and ending in .db. An example file name is FE0131A-54E1-2A8E-B0A0A77CFCA4.db. Grab all the files in the Dock folder with the dashed set of letters and numbers that end in .db and drag them to the trash. Either method works fine. The next time you open Launchpad, the database will be rebuilt. Launching may take a bit longer the first time, while Launchpad rebuilds its database, but other than that, Launchpad should be good to go. OS X Yosemite adds a bit of a wrinkle to the method of removing the Launchpad database. Yosemite and later versions of OS X also maintain a cached copy of the database kept by the system, which also needs to be deleted. Perform steps 1 through 6 above. At this point, you've deleted the .db files in your ~/Library/Application Support/Dock folder, and are ready for the next step. Press enter or return to issue the command. Launchpad has now been reset. The next time you open Launchpad, the app will rebuild the databases it needs. Launchpad may take a bit longer than usual to launch the first time, and the Launchpad display will now be in its default organization, with Apple apps shown first, and third-party apps next. You can now rearrange Launchpad to suit your needs.